The University Digital Library initiative assembles, presents and preserves digital collections that support the teaching and research of the campus and the global community of scholars. Furthermore, the Digital Library at Falvey employs dedicated and hardworking students to provide assistance and direction to its patrons. 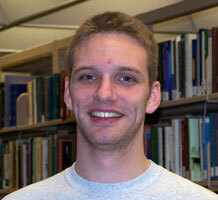 Among these student employees is junior Sean Dunn. Sean appreciates that his efforts help patrons. Some of his duties include scanning materials from the rare collections, manuscripts, Civil War papers and any paper work professors need for instruction. He also scans and saves documents into the library network, which are later uploaded onto the Digital Library web page to be utilized by patrons. A member of the Robotics program, Sean has been master of ceremonies for the program’s Boosting Engineering, Science and Technology (BEST) annual competitions. This program helps educate inner-city secondary school students in the Philadelphia area, inspiring them to pursue careers in engineering and technology. Sean, a resident assistant in Farley Hall, notes that he adheres closely to residence hall policies but also likes to encourage his students to be involved in community-building activities, such as the Asian Expo in February. He has been an “indirect” member of Asian Students Association (ASA), and has mixed the music for their fashion show the last two years. In addition to all these activities, Sean also works with Villanova Engineering, Science, Technology, Enrichment, and Development Program (VESTED). VESTED, which meets on Saturdays, buses in Philadelphia area secondary students to give them a chance to work in well-equipped university laboratories. As a member of the leadership team for VESTED, Sean helps develop the labs, teach the labs and monitor the entire process, looking for ways to refine the students’ experience. Sean has a passion for art: he enjoys sketching and designing objects and likes to take on projects to expand his artistic knowledge. He is also fluent in Latin, which he studied from middle school through high school. His other hobbies include rollerblading, ice-skating and skiing. 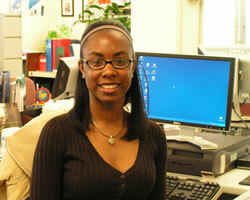 Sierra enjoys working with the reliable staff in the Resource Management Center. Her duties include stamping and labeling incoming books and assisting with other administrative responsibilities. She has also been working at the VU Law School Library since 2008. In addition to her jobs, Sierra volunteers each week as a career assistant at Career Services, helping students with their résumés and cover letters. She is also a member of the Black Cultural Society (BCS); a member of UNITAS, a peer mentoring program sponsored by the Center for Multicultural Affairs; and a member of the Psychology Club. She says “I joined the club to gain additional insight and education outside the classroom experience.” Sierra hopes to attend graduate school to be a biological psychologist, a clinical psychologist or a counseling psychologist. When she is not studying or working, Sierra’s interests include cooking, traveling, dancing and reading. The Bluest Eye by Tony Morrison is one of her favorite books. She also enjoys watching movies with other members of the Black Cultural Society.